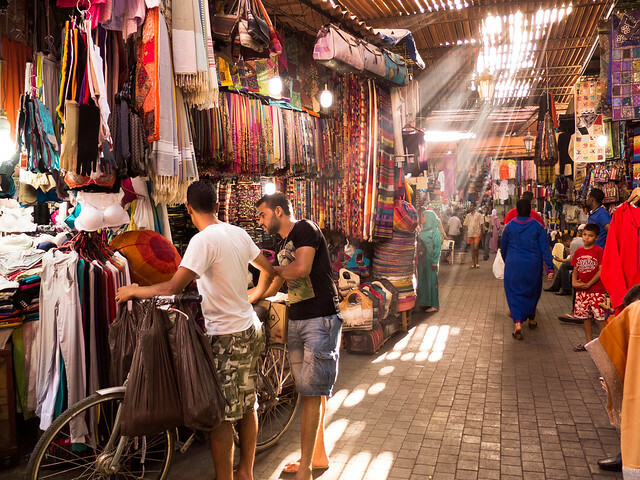 Marrakesh is a great place to start your Moroccan adventure. Fondly called as the Red City, the brick red tinge is going to follow you everywhere. The walls of the medina, city gates, ancient buildings, and mosques all have the pleasant shade of red which makes Marrakesh so distinct. This Marrakesh travel guide will share all the information needed for a comfortable trip to the city. 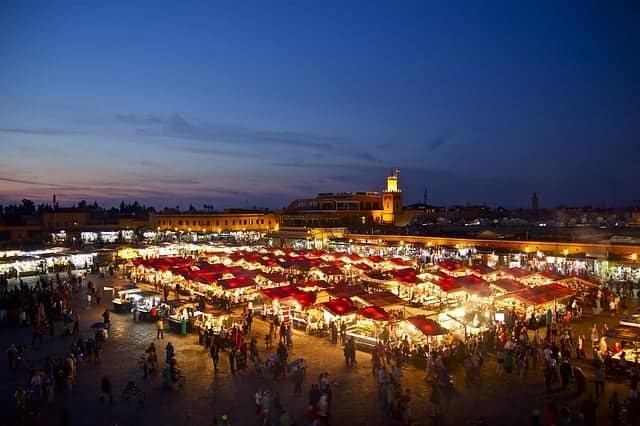 We will tell you when is the best time to visit, where to stay, what to see, and where to drink the finest Moroccan tea with panoramic views of the famed Jemaa el-Fnaa. Marrakesh is well connected with domestic and international flights at the Marrakesh Menara Airport. Domestic flights are from Rabat, Casablanca, Agadir, and Fes, to name a few. There are everyday flights from Paris, Barcelona, Madrid, Lisbon, and more. Many airlines fly direct and frequently between Africa, Middle-east, and Asia. If you are traveling by bus from Fes, Casablanca, or Rabat, there are buses which ply on an everyday basis from companies like Supratours and CTM. There are shared taxis available but they are not really comfortable and reliable. If you have a caravan, car or a bike that you want to ride across the rugged landscape of Morocco, then you will need a valid International Driver’s License. 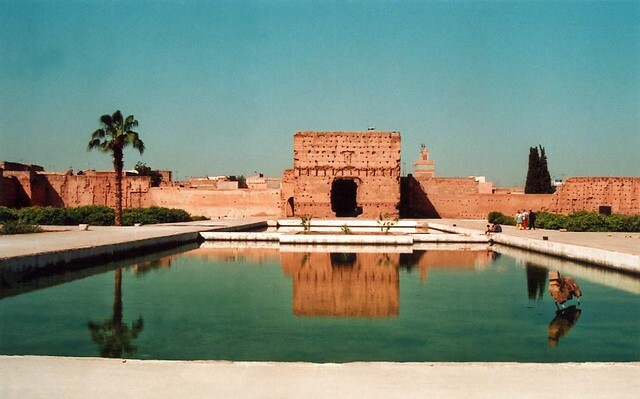 According to the Marrakesh travel guide, it is best to visit this city during spring or autumn. The temperature is perfect to enjoy a variety of landscape like the beaches, Atlas mountains and cities in Morocco. Morocco has visitors all year round. Owing to its proximity to Europe, a lot of people fly to Morocco over a long weekend. Summer is not the right time to visit Morocco because people in Europe, USA, and Canada have their summer holidays. They flock Morocco for vacation and it gets crowded. And not to forget, the weather is unforgivable. It is very difficult to enjoy the desert safari at such high temperatures. Winter is great because there are fewer travelers who are in Morroco. The only downside is that the night temperatures are very cold. You need layers upon layers of warm clothing in the night but the sunshine is warm and pleasant during the day. Where to stay while holidaying in Marrakesh? Marrakesh travel guide recommends staying in a riad in the medina of Marrakesh. 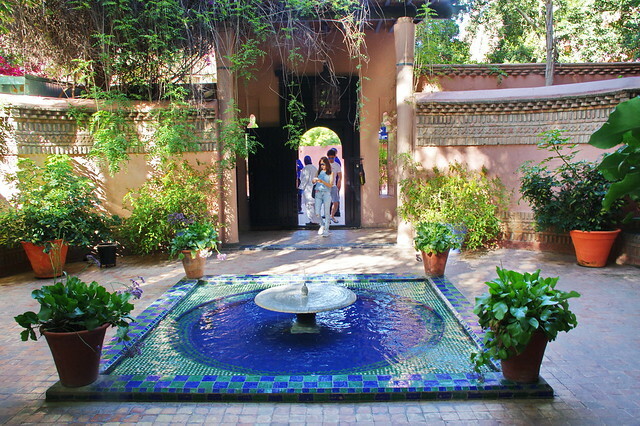 A riad is a large traditional house with a courtyard in the center. The courtyard is where you will enjoy your breakfast or sip on the ubiquitous Moroccan tea. There are climbers, lemon trees and roses which are grown in the courtyard, and sometimes there is a swimming pool. The whole atmosphere feels good as you will find squirrels scampering in the garden and birds chirping. I bet you wouldn’t find this experience in a hotel. You can find great riad options on Booking.com and Airbnb. Staying in a medina of Marrakesh is recommended since the locals live in this part of the city too. You can hear the early morning call for prayers, you will see stray cats loitering around in the streets and old people feeding these cats. 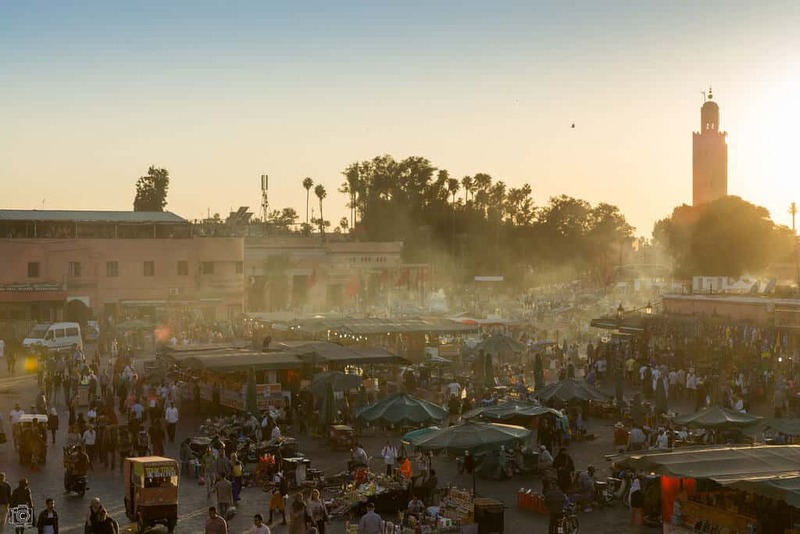 You get a local’s perspective of Marrakesh when you are here. Of course, a lot of tourist attractions are at a walkable distance from the medina. This is a large public square teeming with vendors, entertainers, musicians, artists, and more. A lot of TV shows have showcased this market square and a lot of travelers have described Jemaa el-Fnaa in its truest sense that this place is overwhelming!! Used as a place of public execution, once upon a time, the Jemaa el-Fnaa means ‘assembly of the dead’. Today, it is a thriving marketplace with an assortment of activities going on. There are vendors selling food, orange juice, keychains, spices, souvenirs, leather bags, carpets, babouches, tajines and more. Henna artists, singers, musicians, snake charmers, people performing acrobatics are a common sight here. If you are an animal lover, you are going to have some serious heartbreak as there are a lot of wild animals used to entertain locals and tourists. I highly recommend that you do not pose for a picture with a snake around your neck as this creature has been ill-treated and it is not cool. It was gutwrenching to see squirrels, lizards, and rats tied to a pole and made to hop, roll and what not. There is so much noise from all this activity that it feels like a sensory overload. Step away from the madness if it gets too much to handle. There are a lot of buildings that surround the market square. All the first and second floors of these buildings have been converted into cafes for tourists like us. You can peacefully sit there, sip endless glasses of mint tea and observe the crowd from the comforts of the balcony. These cafes have a policy where you pay to enter with which you can buy tea. This is a business technique to avoid travelers from entering the place just to click pictures of the amazing views of Jemaa el-Fnaa from the terrace. In the night, the cacophony reaches a new level. There are many makeshift shops selling meat and bread. The air is smoky and you can smell burning meat in the air. There are more musicians and dance performers now than in the morning. The towering minaret that you see from Jemaa el-Fnaa towards the western side is the Koutoubia Mosque. The brick red building was built during the 12th century by the Almohad dynasty. 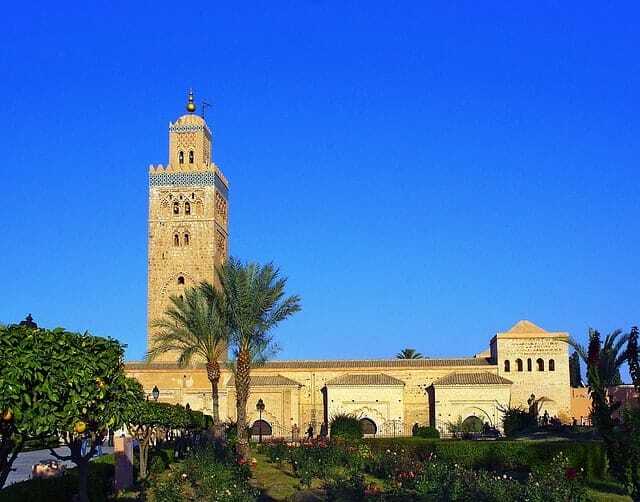 The minaret is 70 meters high and it is the largest mosque in Marrakesh. Non-muslims are not allowed to enter but you are free to explore outside. There is a nice garden beside the mosque where you can sit and relax. This 19th-century palace was built was the Grand Vizier Si Moussa in the 1860s. Over the course of years, it has changed a lot of hands. But one thing is for sure, they had the finest artisans whose skills are clearly evident in every aspect of the Palace. The gardens in the verandas are lovely. 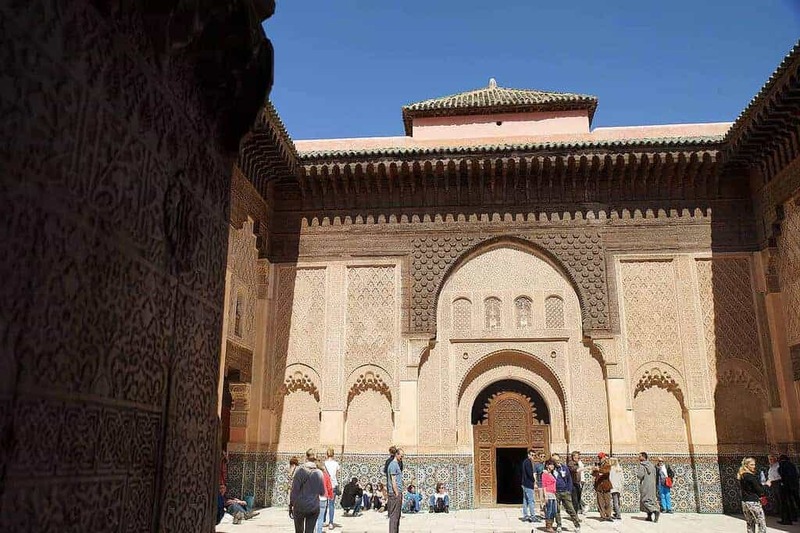 The Marrakesh travel guides recommend visiting the Bahia Palace first thing in the morning as the line for tickets can become quite long. A beautiful and relaxing garden in the middle of Marrakesh. Situated a short distance from the main square, this is a wonderful place to visit if you need a break from the crowds. Within the same grounds, there is the Berber Museum, where you see showcase clothing and tools of indigenous North African people. 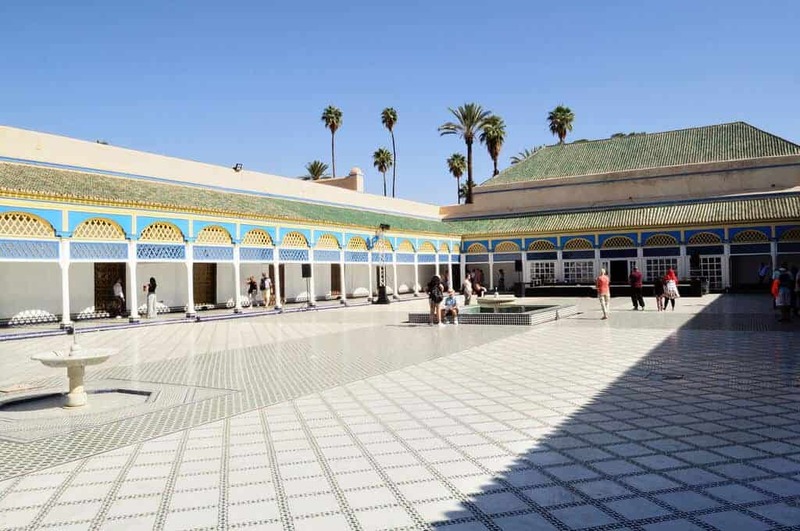 Also, there is the Islamic Art Museum of Marrakech where you can see some of the Saint Laurent ‘s collection of ceramics, jewelry, and textiles. The palace was built by the sultan Ahmad al-Mansur of the Saadian dynasty in the 16th century to commemorate a battle victory against the Portuguese. This palace has complete information throughout the visit, in English and even has a video description of the history and the original look of the place. The palace ruins are beautiful, dramatic, and monumental. The stunning the intricacy of the wood carvings and tile work that cover every inch in this Islamic college will amaze you. It is nestled inside the busy medina and costs only 20 dirhams to get in. You can consider this museum an offbeat place to visit. The archives consist of photos from Moroccan history, ancient and recent. One thing that you will notice is that nothing much has changed in Morocco. This country transports you a different era, thanks to its people retaining their heritage carefully. There are some brilliant photos showing what life was like as well as a documentary on Berber life. 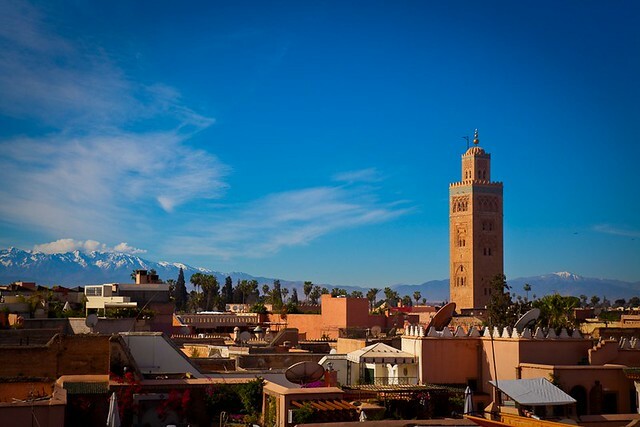 A reasonably priced restaurant is on the rooftop with a great view over Marrakech. 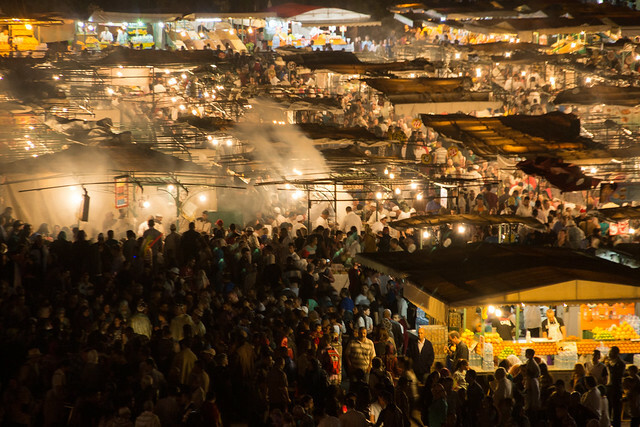 The maze of market streets that stretch north from the Jemaa el-Fna are the souks. There are lanterns, fruits, spices, dry fruits, perfumes, leather goods, carpets, clothes, food, and everything is sold here. A great place to capture pictures especially in the evenings when the souks are lit up. When you intend to buy anything, please bargain as the vendors charge thrice the original price. When you are walking around Jemaa el-Fnaa, there will be people inviting you to their shacks to feast on the meal they are serving. You will find a lot of locals and tourists seated in those smoky tents dining on a variety of Moroccan dishes. 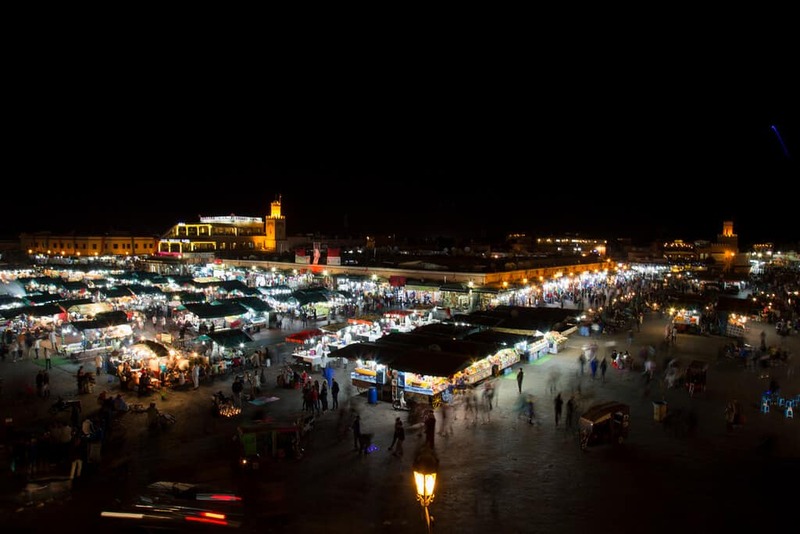 The Marrakesh travel guide strongly suggests that you walk towards the bylanes on the western side of Jemaa el-Fnaa. There are nice open-air cafes where you can order a tajine of couscous with chicken or bread and vegetables with chicken. There is a lot of variety in the dishes are offered here. 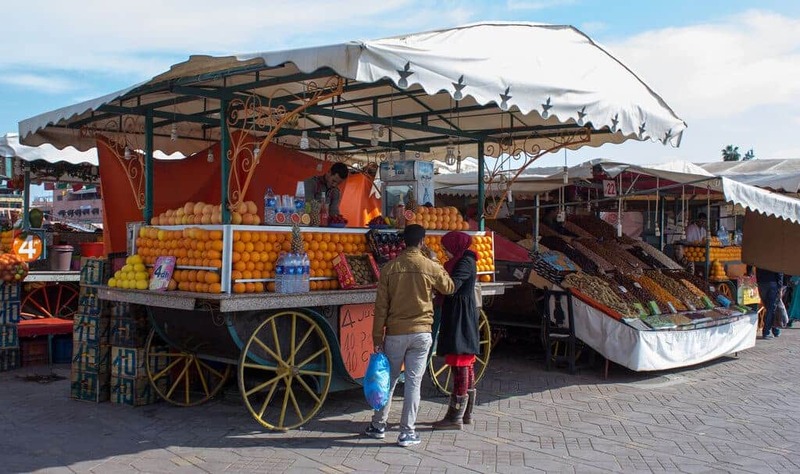 One thing that is recommended for consumption in Jemaa el-Fnaa is the orange juice. Fresh fruit juice without any added water or sugar. It is refreshing to drink in this busy marketplace and it tastes so sweet! Carry your own water bottle and drink from that as you might not want to drink in the glassware that the vendor serves in. 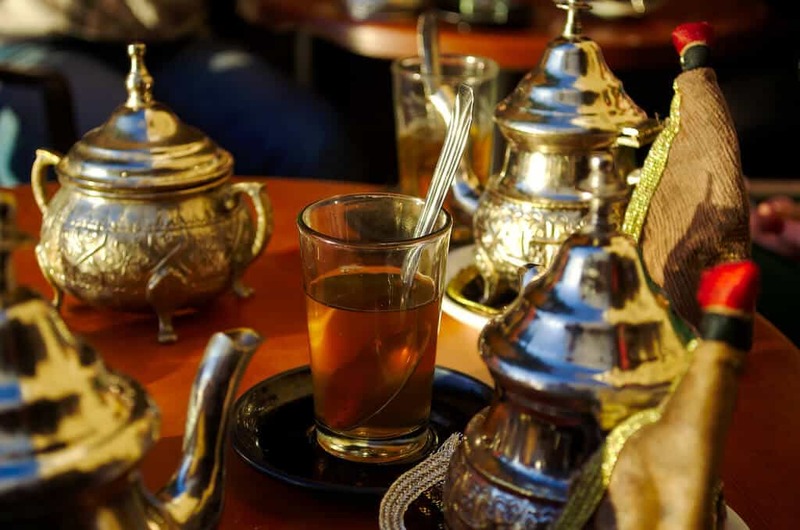 You might end up drinking more Moroccan tea than water while you are traveling in Morocco. It is a sweet mint tea consumed in a decorative glass. The art of pouring the tea from the teapot is an act in itself which is perfected by the locals. 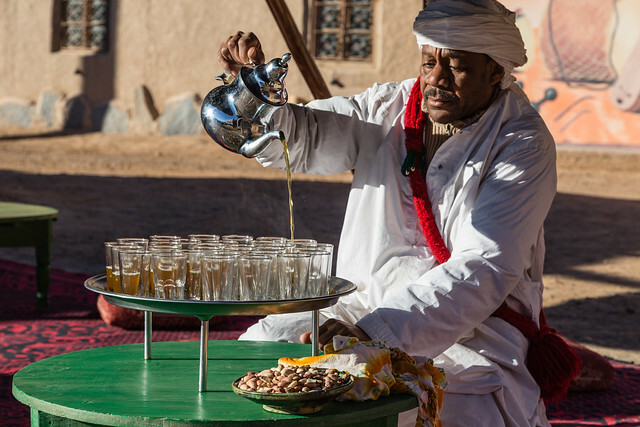 Pouring from a height leaves the tea frothy which adds to the flavor of Moroccan’s favorite beverage. 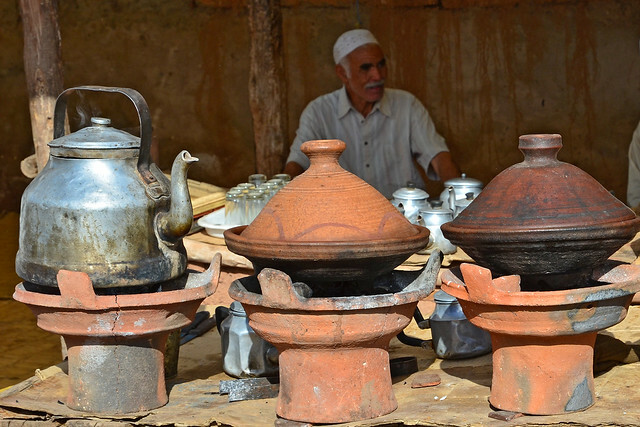 Try dishes cooked in the typical Moroccan earthenware pot called the tajine. The chicken, lamb or vegetable stew that is cooked in the tajine is very tasty and should not be missed. It is located in the medina of Marrakesh and serves Italian and Moroccan cuisine. Book a table in advance if possible. The patio and rooftop in the evenings are such a great option to relax and the view of the city os good. You can order beer and wine along with tapas here in this cafe. An Italian restaurant where the pizza is oven baked and served fresh. They also have pasta, meats, seafood, wine, and liquor. Traditional Moroccan cuisine served with live music for the entertainment of the guests. It costs around USD 70 per person which is slightly high. But the ambiance in the restaurant is very soothing. How to travel within Marrakesh? Most of these places are within a walkable distance. A few places are not within walking distance, you can hire a yellow taxi. the taxi charges you between 5 – 8 USD to travel a distance of 3 miles and above. How comfortable is it for female solo travelers? There are a lot of solo female travelers in Morocco. It is a safe country and there is nothing to worry apart from the obvious travel precautions to be taken. Do not walk alone in the medina after 9 pm. It is a bad idea to walk in this area alone since it is isolated and not all streets have street lights. Morocco is a conservative country so please dress appropriately. Wearing full-length trousers or skirts that are cover your knee paired with a comfortable shirt or a cardigan is a good idea. Carry a stole with you, as it comes in handy while traveling. It is safe to travel with kids. Please be careful and always keep an eye on them in Jemaa el-Fnaa. Do not buy leather carpets upon the insistence of your guide. He is obviously earning a commission by suggesting one particular shop. Compare prices before buying anything. Marrakesh travel guide suggests Ensemble Artisanal on Avenue Mohammed VI which is 1 km away from Jemaa el-Fna. It is an Artists Collective subsidized by the Moroccan Government where you can buy local handmade products. Be careful about your belongings in crowded places as there are chances of getting robbed. Do not carry all your cash in the wallet. Keep some in your trouser pocket too. It is a day dedicated to celebrate the king, His Majesty King Mohammed VI’s ascension to the throne. It is on July 30 when people take to the streets to celebrate with fireworks, parties and parade. Help over 3 days between September 14 – 16, it is an international event with artists from Europe, North Africa, and the Middle East. Coupled with an on-site spa, daily yoga and meditation, sun-soaked swimming pools and tropical gardens, this music festival in the midst of the Red City is like none other. Find more info here. Best movies, actors, and filmmakers who are nominated are awarded in this special event held over during the first week of December. You have to buy your ticket online to get a chance to enter the venue. Find more info here. I hope this Marrakesh travel guide helped you with all the necessary information for a good time in this amazing city. Do write to us, in case you have any questions and we at Talk Travel are happy to help. If you need any help in building a travel itinerary or you have any other query, download our free TalkTravel App. It is available for download on your Android or iOS device. You can download the TalkTravel App for free and reach out to the local expert without any additional cost. You are free to ask any doubt before or during your travel and our local expert will be ready to assist you. We wish you a safe and happy travel! So glad to meet you, Los Angeles! Talk Travel - Talk to Travel Better !!! ©2019 Talk Travel. All rights reserved.